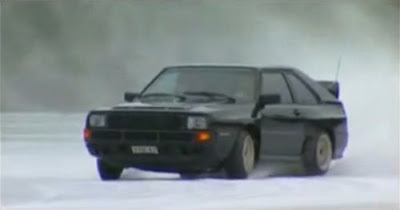 There's something about watching an Audi quattro snow drift that makes any quattroholic hope for a blizzard. This video however, puts all other winter joyrides to shame. Watch as this Dahlback Audi Sport Quattro, equipped with studded snow tires, tears across a frozen Swedish pond. This clip comes from Swedish motoring program Motorjournalen. Unfortunately, the entire video is in Swedish, so we have no idea what is being said (and it looks like there's some pretty interesting commentary). Fortunately, the sound of the Sport Quattro's turbo 5-cylinder is a language anyone can understand.